With the advancements that have been made in technology in the past two decades, the world of digital signage has made a significant leap into video. Many businesses have opted to upload video into their digital signage systems. From the audience’s perspective, videos are more engaging than a simple text or even a picture. Motion attracts the eye. Pair this with the right approach and the right content, and you’ve got a winner on your hands. For those that are new to digital signage and/or are considering including video in their presentation, we have a few tips to help optimize its inclusion and to ensure that the effort doesn’t backfire. In the same way that you would want to keep a text-based message as short as possible, you want to do the same with a video. In terms of a graphic and text-based message, you will have on average three to five seconds to engage the customer. With a video, you have approximately a minute. Video gives you a little more time however that doesn’t mean including a fifteen-minute video exploring the most intricate details of your industry is the best way to engage your customer based. Break it down to a summary. Make it quick. If all you have is an information-based message that doesn’t utilize any visual presentation to spread your message then some may remember but most will forget. Depending on the nature of the subject matter, there are a few different routes to take but ultimately you want to make it human. Be funny. Be real. Be emotional. Be entertaining. Every business is going to be different. Many find the most memorable way to make an impact is through humor and they craft a message based around a humorous approach. This is very popular. Others may find a more emotional story to be the most effective way to reach their audience. Every business is different. The more people that are involved with a video-based digital signage campaign, the lesser the load on you and the more effective the process will be. By letting your employees assist in the creation of the video or even by including them in the video, you’ll appeal to the local community if you’re a small business as well as will give your employees an investment in your business. The acknowledgement and inclusion of employees is often times enough to make them feel invested in your company. You may even be pleasantly surprised by their creativity. We live in an age where everyone shares shaky videos made from their smartphone, laptops, and other handheld video devices. The days of being “professional” have gone out the window. Professionalism has little to do with the content of the video in terms of connecting with the audience. Viewers want authenticity. Don’t worry if your video isn’t perfect in terms of framing or in steadiness. The incorporation of video in digital signage campaigns continues to gain popularity with every passing year as the culture moves to one where video is used as our primary form of communication. The days of a graphic and a sentence of text haven’t passed entirely but as we continue to move towards a more interactive digital signage format, video will play an important role in the future of successful campaigns. Videos are no doubt the future of communications and digital signage isn’t an industry exempt from this trend. The easiest way to engage users are through compelling videos and it’s a great idea to not only use videos in your digital signage campaigns but to post these same videos on your company YouTube channel or company website. 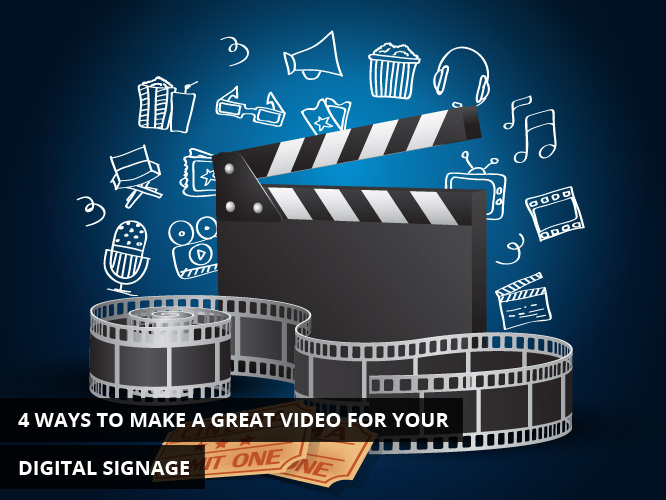 Use these 4 ways to make a great video for your digital signage and engage your audience with a more effective message today.